DEAR PAPERLICIOUS: An Interview with Laura Bassen! 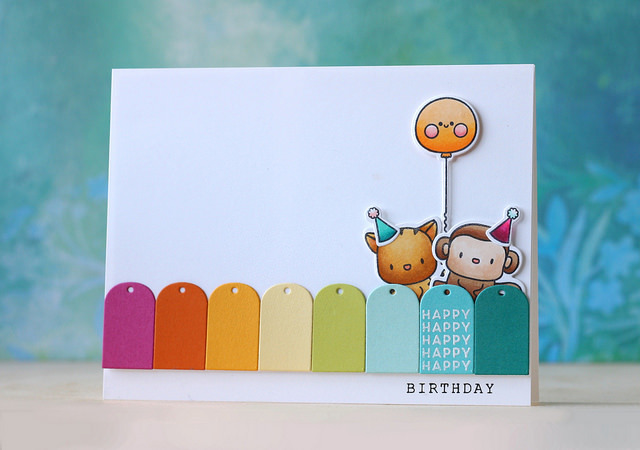 You know Laura Bassen and her fabulous blog, Doublestick Heaven, as the creator of perfectly executed and colorful designs, and funny and informative videos. She’s the master of masking, ink blending, and creating plaids. I was curious how this mother of five young kids manages to create and blog so many beautiful designs. So, I was thrilled when Laura agreed to be interviewed. Rather than send questions and answers through email, Laura and I spoke on the phone for about an hour and a half (oh, we both have the gift o’ gab!). Joan: Let’s talk card design first. How do you come up with an idea for a card? Laura: Joan, I don’t know! Really, it can be a bit of a mystery. I no longer stamp just for fun. It has honestly become a job, and I’m usually creating a card design for an assignment or because I agreed to help promote something or someone. So, I usually start with a stamp set or other products that I need to feature. Ninety percent of my design of a card is done before I pick up an ink pad. Most of the time I’m thinking about different designs and just trying them out in my head. Depending on when I get the stamps or other products, it can take awhile. Sometimes I take a products’ release and spread it out on my kitchen table and see what jumps out or inspires me. I knew I wanted a background, and was feeling a bit stuck. I checked out Betsy Veldman’s because I know Betsy has great backgrounds. Every card is an evolution from brainstorming to execution. It never ends up how I pictured it in my head. Sometimes it's better and sometimes it's a flop. Then I start again, until I'm satisfied. Joan: So it’s natural talent? Laura: It does take talent, but mostly it takes hard work and perseverance. If you want to do design work, you have to work at it. You have to push through design blocks and insecurities. I think true success comes from walking that fine line of simply loving the craft and always striving to improve. I'm never satisfied. I always want to improve on my techniques, my photography, my videos. That's what keeps me going. Joan: Your cards are so bright and fun and crisp. Is there a particular ink you recommend? Laura: Oh, boy! I love inks. There are so many out there and they all are great for different reasons. It really depends on the technique. If I want to "ink smoosh" I use the Distress Inks. 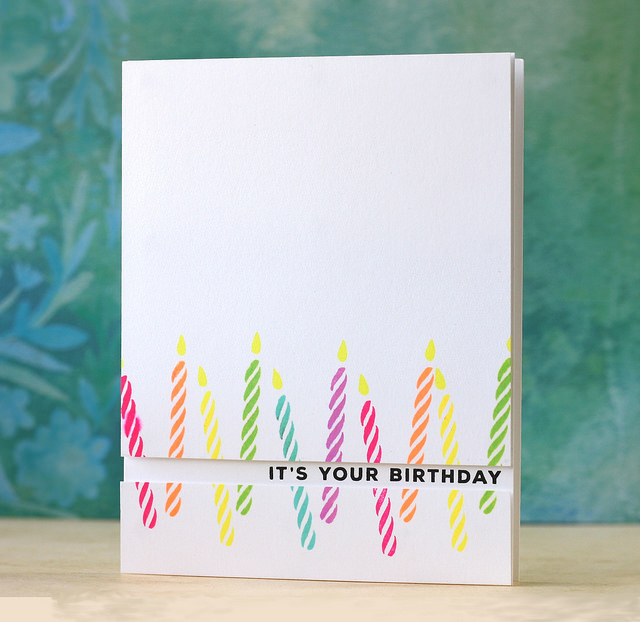 If I want to blend, I use my Simon Says Stamp inks. The Mama Elephant pigment inks blend like butter, too. For Copic coloring I use Memento Tuxedo Black and for crisp black sentiments I use Versafine Onyx Black. Joan: How did you go from making cards as a hobby to having a job in the industry? 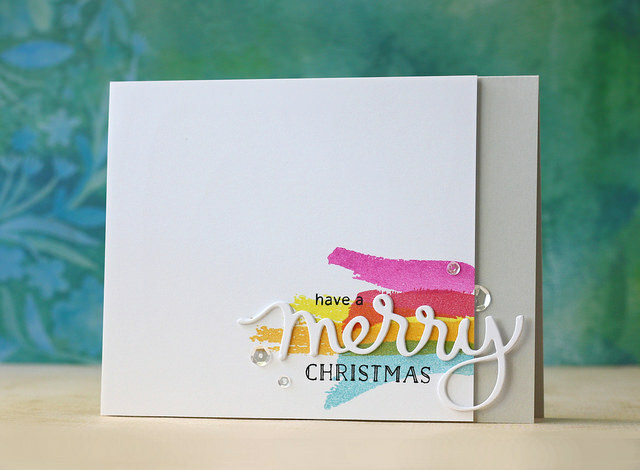 Laura: Initially I started my blog because I wanted to be part of the stamping community and participate in challenges. Eventually it led to design team opportunities, most of which were not compensated. Now, stamping is my job, meaning that I earn a real income at it. I get to work from home doing something I love. It honestly is a dream job for me. It's not a cake walk, but I really love it. Joan: I can imagine the fun parts. What’s the “not fun” part? Laura: The hardest part is keeping a healthy balance between family life and work. If you don't watch it, card making can take every last second of your day and you will miss out on the important stuff. The other part that is not-so-fun is the juggling of multiple deadlines at once. The pressure of producing quality work on demand can sometimes be a strain. Also pushing through insecurities and self-doubt is an ongoing battle that everyone faces. Joan: How do you make money? Free product, pay? Laura: Many companies pay their designers and some pay with free product or offer affiliate linking. Joan: I always wondered how affiliate linking worked. To be honest, I never think to purchase through affiliate links. Now I will. Laura: It is a great way to “tip” your favorite designers without spending any money yourself. In other words, the stamper is going to pay the same amount regardless of whether he or she clicks a link on my, or some other stamper’s, blog. Joan: Let's talk videos. Yours are fabulous. What’s your secret? Laura: Editing! I try to make a video that I would want to watch. I like them short and sweet, so I edit to take out parts that I don’t think are necessary. Joan: Are they time consuming to make? Laura: Yes. It can take most of the day to create a card, film it, photograph it, edit the photos, edit the video footage, do the voice-over, upload it & then write up a blog post. You would be astonished at how many times I have to record myself saying hello over and over again until I'm happy with it! Joan: You do a great job of making people want to buy a stamp that someone else designed. Have you ever thought about designing stamps? It was a blast talking with Laura. She was interesting and motivating. Knowing how full her life already is, I really appreciated the time she took to chat and edit this interview. I hope you enjoyed it as much as I did. Note: there will be no interview posted in January, but I have a fabulous one scheduled for February! Thanks for reading! thanks for the fun interview with Laura - i love her style, humor(which shines in the interview)and bright cards! I love Laura AND her work! She is SO entertaining and her cards are amazing so its always a great day when I see she has something to share! I really enjoyed this peek into Laura's world, Joan! She is right up there as one of my clean and simple favorites, along with Kay Miller. When I see her work, I *always* think, "Wow! Wish I'd thought of that!!" I hope you have a wonderful, peaceful Christmas. Awesome interview...I wish it was longer, just to know more about her work & etc. but she's got those five kids...design team work, a hubs and God knows what else going on...her time is precious. Love her blog too. Thanks for interviewing her...love her a lot. Thank you for the fun interview! I love Laura! 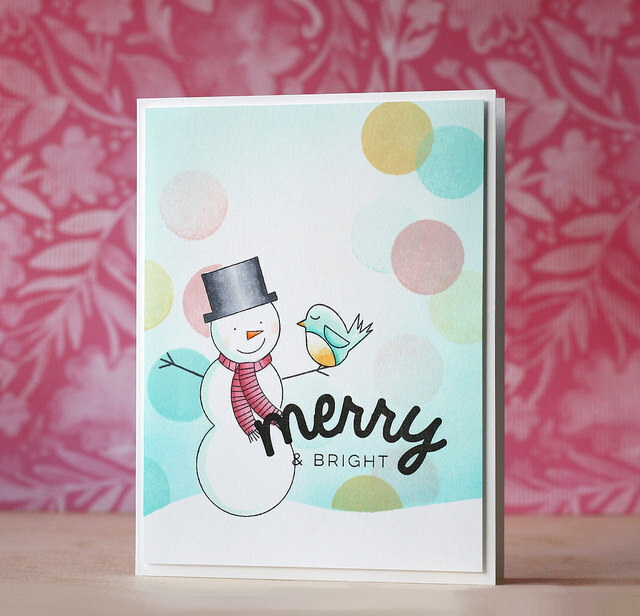 She is awesome and has taught me so much about card design through her blog and videos. Thanks for the great interview with Laura. She is an inspiring card maker. I adore Laura...she's am amazing lady, Mom, Designer and friend..so happy to see you love her too!! Laura has amazing talent and her cards make my CAS-lovin' heart so very happy! Thanks so much for sharing your conversation with her, Joan. Thanks for sharing your conversation with Laura - she rocks! And so do you! Great interview - Laura is one of my idols! This was so fun! It was great to get a peek into her world. I think she ranks up there as a favorite of a lot of us! Awesome interview, Joan! Great questions and fun answer from Laura. Her work is amazing and her videos very entertaining. I admire her ability to juggle her family and working from home with deadlines galore. My friend Janeen sent me here and I am so glad she did. What a great interview. Wishing you a wonderful holiday! What a great interview. I love Lauren's style & her fun videos. I'll bet the two of you had a grand time talking as you are both so fun. Thanks! Love, love, love this interview! Laura's style is clean, colorful, sometimes fun, and sometimes elegant. I wish I had her talent but since I don't I'm happy that she has videos and shares her tips.